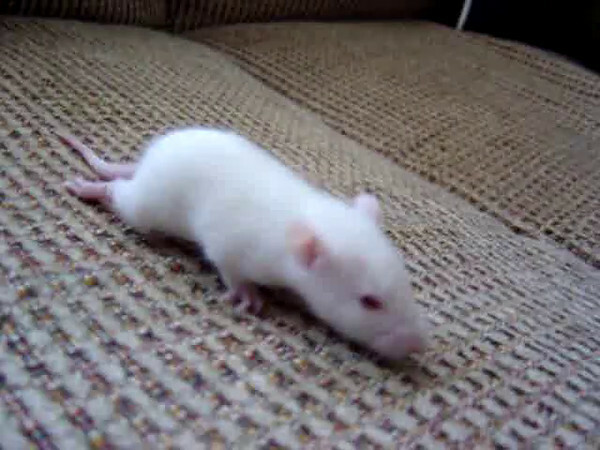 Here is a video of Marley or Dani ( not sure which, they were identical twins) at 15 days old, two poster children to warn against recklessly interbreeding ratties. These lovely little babies were born from the typical pet store snake food Momma, who was surrendered to the local shelter here in Pittsburgh. We took them into the Club and found homes. These two little girls were unable to use their hind legs at all at birth. The young lady who had adopted Mom, contacted me about them wanted to keep them, and I signed on to be medical advisor. Marley and Dani ate well, scrambled around with their siblings, but as they grew they were overwhelmed by their sisters and brothers. My friend separate them after weaning and kept them as a pair. As they grew, they started to have some limited use of their hind limbs, and we watched and waited. They were much smaller than their siblings, and their growth was not as rapid. Both girls developed a hairless patch about the size of a quarter, in the identical spot .. on the left flank. I tested for mites or ringworm, all tests negative. The hairless patches remained with them for life, never resolving but never getting bigger …so strange! At about 3 months of age my friend called me in a panic, to come examine Marley, whom she thought had gotten her left foot caught in the cage, it was swollen and bleeding. On examination, the middle 3 toes of the left foot were black and necrosed, and the foot was swollen and infected. I also noticed that her tail tip was black and necrosed. Amazingly, when I looked at her sister Dani, the middle 3 toes of the left foot were swollen and red, and her tail tip was black and necrosed! I realized that we had a genetic abnormality here … not sure what. I asked to adopt the pair so I could give them constant medical care under the careful eye of our wonderful Dr. Mike. The two sisters continued to show exactly the same clinical problems … the 3 toes of Marley’s left foot died and fell off after a month long struggle to save them. About 3 weeks behind her sister, Dani’s toes necrosed and fell off. The tail tips continued to necrose, and fell off, about a month apart for the two sisters. Then, the middle two toes on the right feet started to get bad on Marley. Sure enough, about a month later, Dani’s middle two toes on her right foot started to get bad. They both lost those toes as well. Despite constant daily treatment (chlorhexidine soaks, SSD cream with bandages, systemic antibiotics, other unusual drugs suggested by Dr. Mike) … I could not save their toes or their tail tips. But, they stabilized at about 8 months of age and no further toes were lost. Dr. Mike conjectures that the femoral arteries feeding the two hind legs, and the artery that feeds the tail, were malformed and too small, and the extremities just could not get enough blood. Dani and Marley lived a relatively normal life, having gained enough control over their hind limbs that they were able to run and play (although their ambulation was not normal), even running on the wheel. Marley lived to about 1 year 9 months, and finally died from petit mal seizures and concurrent respiratory infection. Dani lived another 6 months or so, and finally died from a neurological lesion. They were bright, affectionate, and outstanding examples of how we should live our lives .. they lived their lives to the fullest, despite their disabilities! 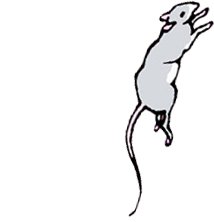 We called them our “Two Rat Parade” because of their enthusiasm for everything that happened every day. I will remember them, and miss them, for as long as I live.